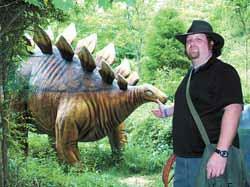 “Walk in the Time of Dinosaurs ” is a piece of a summer-long sequence of history programming offered by Columbia resident Derek Cameron, who goes by the nickname “Mr. History.” With his degree in Archaeology and Anthropology, Cameron has a distinctive way of allocation his love of history. His specialty in new archaeology has led him to build a selection of historically exact pieces, together with both Roman and Greek suits of armor. He brings his considerate of society and approval for history to his presentations. In adding up to all the huge history and artifacts that Mr. History will be distribution kids can imagine to create and cover their individual fossil casts and 3-D dinosaur models,” Children’s Librarian Mecca Caron assumed. “Guests to the Children’s Library connecting June 16 and June 25 can still see a dinosaur bones replica produced by Mr. History. We expect this show will draw notice to the program and possibly even more visitors that day.” Other programs in the chain include earliest Egyptian Pyramid Builders, Medieval Times, Pirates and the Ice Age.